Marin Mommies presents a sponsored shout-out from the Terra Linda Community Center. 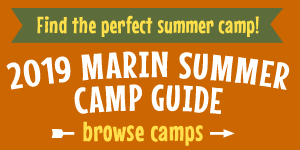 Looking for fun camps for your kids this summer? Check out the camps from the Terra Linda Community Center! Camps include Babysitter University and Junior Lifeguard Camp, Splash Camp, and Fun with Clay. See below for details on each camp. Also, a variety of swim lessons are available at both the Terra Linda and Hamilton Pools at www.livelifelocally.org. Become a role model for children! In this action-packed week you will learn babysitting skills, first aid, CPR, and become American Red Cross Certified. Come enjoy games, team building exercises, and fun in the sun! Learn what is takes to become a lifeguard! You will learn skills needed to help respond in emergencies, water rescues, entries, head and back injuries, and first aid. Summer camp and swim lessons all rolled into one! Games and crafts, playground fun, supervised pool time, and a 30 minute swim lesson Monday through Thursday! A week of summer fun with clay! Use your imagination and explore the amazing world of clay. Learn to pinch, coil, slab, and glaze.